In Part 1 of this article, we observed that, in reality, most DUI cases don’t get thrown out of Court by a Judge. We then saw how important a role “alcohol,” meaning a person’s relationship with it, plays in the course of any DUI case that’s not summarily tossed out of Court by the Judge. We concluded and underscored this by pointing out the fundamental role of “testing” for alcohol while a person’s Drunk Driving case is pending in Court, and the key role “testing” plays in any Probationary Sentence. In this second installment, we’ll continue our examination of the role of “alcohol” in a DUI case, and look at how my specialized knowledge of the onset, diagnosis, and treatment of an alcohol problem gives me unique advantage to help make things materially better for my DUI Clients. Many Judges in the Tri-County area will handle hundreds, if not more than a thousand DUI cases in a given year, yet most of those same Judges will only dismiss a few, if any during the course of their entire careers on the Bench. As we noted in the first part of this article, if a DUI case is solid enough to not get dismissed, then in a very real way, we can say that as it winds its way through the Court system it’s all about the alcohol. 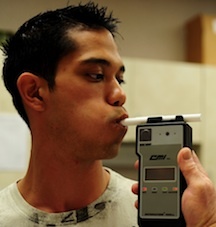 If you’re reading this, and you are on Bond, and required to “test” for alcohol, there’s your proof. This should not come a surprise. The Law requires anyone convicted of a DUI to undergo a mandatory alcohol assessment test before the Judge can Sentence him or her. A person must be screened to determine if they either have an alcohol problem, or the potential (or predisposition) for an alcohol problem. This “screening” is done in the form of a written test. The person’s answers are scored, and the final score is compared to a scoring key, and a written Recommendation is made to the Judge as to what level of classes, counseling, education or rehabilitation they need. There is a lot more to this, of course. In fact there’s so much to it that not only is the development, diagnosis and treatment of an alcohol problem a keen field of interest of mine, I am actually involved in the formal University, graduate-level study of this very subject. If you are going to make a living in an area of the Law where the diagnosis and treatment of an alcohol problem is front and center stage, it makes sense to have credentials, education and experience in this field, as well. Understanding how an alcohol problem is diagnosed, and the specific criteria used to make such a diagnosis, however, will remain centrally relevant throughout the rest of the case. As we’ll see shortly, “over-diagnosis” of an alcohol problem, or the possibility that a person can or will develop one, is a huge problem with far-reaching, expensive consequences to someone dealing with a DUI charge. Being able to point out to the Judge when that happens, and being able to protect my Client from getting stuck in classes he or she doesn’t need is critical to producing better results in DUI cases. This makes perfect sense. If most of the strictly “legal” considerations of a DUI stop, as they do, once the case is either dismissed, or not, or the charge is otherwise reduced, then the purely legal skills of a Lawyer don’t matter very much anymore, either. Yet since the whole focus of any DUI case that goes forward is upon the person’s drinking, and whether they have a problem, or not, then understanding how a drinking problem is diagnosed would seem to be rather important, wouldn’t it? The point is that once a recommendation is made, you can BANK on it being followed by the Judge. My concern, as a student of the alcohol problem part of this equation, is that there is CHRONIC over-diagnosis and unwarranted findings of a potential alcohol problem. I could write a book about this, but how about this for a bottom line: Finding that a person needs classes or counseling generates revenue and perpetuates the growing DUI industry. I am the Lawyer who can step up and point that out. I have the education and knowledge to make these arguments. In fact, with very few exceptions, I have far more clinical knowledge about the development, diagnosis and treatment of an alcohol problem than anyone else in whole Court system. As it turns out, most Probation Officers, who have little to no formal training in the field of addiction studies, simply conclude that everyone who gets a DUI needs some kind of classes or Counseling. Since they aren’t educated in the language of alcohol and addiction professionals, they have to rely upon “over the counter” type screening tests that “score” where a person supposedly falls in the continuum of having an alcohol problem, or not. Just recently, I took up the issue of over-diagnosis with another local Judge. The Judge agreed that my Client could have an outside, independent alcohol evaluation because of problems I raised with the one he had taken for the Court’s Probation Department. Thereafter, my Client had an alcohol assessment done at Catholic Social Services, by a degreed and credentialed Counselor, who found that he did NOT identify with anything like an alcohol problem, or the potential for one to develop. This Counselor specifically wrote that my Client did not need any classes or Counseling. Despite the problems that I pointed out to the Judge that resulted in his ordering an outside Evaluation, and despite the very specific findings and recommendations that resulted from that outside Evaluation, the Probation Department nonetheless told him he needs to go to some kind of Counseling. Of course, I’ll be taking this matter up with the Judge, but the point is that at least I have the specific knowledge to make this argument and challenge the Probation Officer. None of this would even be apparent, much less arguable, to someone who can only press buttons on a breath test machine. For those who have some knowledge of Addiction issues, I’ll specifically be arguing that the reason the outside Evaluator is correct, and the reason Probation is wrong is that, according to the Diagnostic and Statistical Manual, 4th edition, a person must have had “recurrent” problems occasioned by their drinking for an “alcohol abuse” diagnosis. My Client identifies with none of the markers or traits of a drinking problem, and has only this one DUI as any kind of negative consequence to his consumption of alcohol. By having locked the Judge into going along with the independent Evaluation, I will be able to protect my Client from having to go to expensive, inconvenient, and most of all, needless counseling. Accordingly, the real focus of a DUI case is, as we have noted, on alcohol. You can cut it anyway you like, but every Judge, in every case that winds its way through the Court system, is looking at one thing, and one thing only: Alcohol. If you recognize that, you can have a positive and significant impact on what does and does not happen to you. If you take your eye off the ball, you can spend a king’s ransom chasing everything else, and not be the slightest bit better off for it. I can help. I am a DUI Lawyer who studies and understands the onset, diagnosis and treatment of alcohol problems. I speak the language of the Judge and Prosecutor, but I also speak the language of the alcohol and addiction professional. If you are facing a DUI and are looking to hire a Lawyer for a case in Macomb, Oakland or Wayne County, then you probably should speak to me.